A JEWEL OF A BEETLE, AND WITH ITS 4 CM A BIG JEWEL. The beautiful, peaceful animal with its black body that contrasts superb with the glistening silver of the air layer on the belly side, is a welcome guest in the net of every pond hunter. 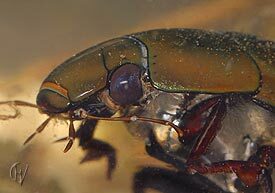 There's a shadow over the joy of such a meeting: the numbers of the spinning water beetles have diminished dramatically over the last decennia. The waters where they live are still being destroyed by the ongoing urbanisation and modern agriculture water management. Enough reason to put it back into its wet world, though a few photo's won't harm - good to show people there's more than dirt in the ditches. 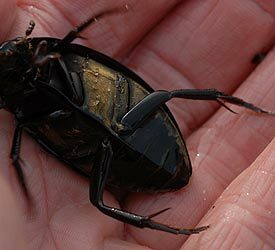 The Great Spinning Beetle is a "nice handfull of beetle". Much larger than the Small Silver Beetle, pictured at the same scale on the right. Both beetles where in one and the same haul of the net, what I call a lucky strike! 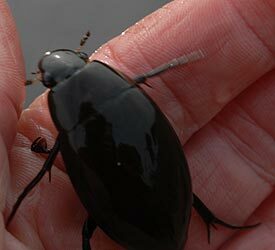 The Small Silver Beetle by the way is also one of the larger water beetles, because most species are sized just a few millimeters.